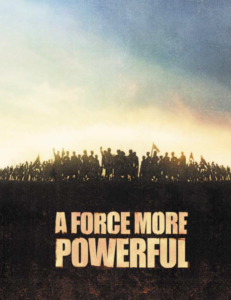 A Force More Powerful is a documentary series on one of the 20th century’s most important and least-known stories: how nonviolent power overcame oppression and authoritarian rule. It includes six cases of movements, and each case is approximately 30 minutes long. In India in the 1930s, after Gandhi had returned from South Africa, he and his followers adopted a strategy of refusing to cooperate with British rule. Through civil disobedience and boycotts, they successfully loosened their oppressors’ grip on power and set India on the path to freedom. In the 1960s, Gandhi’s nonviolent weapons were taken up by black college students in Nashville, Tennessee. Disciplined and strictly nonviolent, they successfully desegregated Nashville’s downtown lunch counters in five months, becoming a model for the entire civil rights movement. In 1985, a young South African named Mkhuseli Jack led a movement against the legalized discrimination known as apartheid. Their campaign of nonviolent mass action, and a powerful consumer boycott in the Eastern Cape province, awakened whites to black grievances and fatally weakened business support for apartheid. In April, 1940, German military forces invaded Denmark. Danish leaders adopted a strategy of “resistance disguised as collaboration”—undermining German objectives by negotiating, delaying, and obstructing Nazi demands. Underground resistance organized sabotage and strikes, and rescued all but a handful of Denmark’s seven thousand Jews. In 1980, striking workers in Poland demanded independent unions. Using their leverage to negotiate unprecedented rights in a system where there was no power separate from the Communist Party, they created a union called “Solidarity”. Driven underground by a government crackdown in 1981, Solidarity re-emerged in 1989 as Poland’s governing political party. 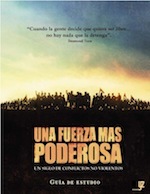 In 1983, Chilean workers initiated a wave of nonviolent protests against the military dictatorship of General Augusto Pinochet. Severe repression failed to stop the protests, and violent opposition failed to dislodge the dictatorship—until the democratic opposition organized to defeat Pinochet in a 1988 referendum. A 16-page Study Guide designed for high school and college use is offered as a free downloadable PDF file. 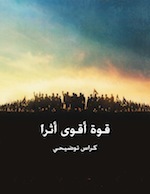 Available in English, Arabic and Spanish. The Study Guide contains program synopses, background information, pictures, descriptions of nonviolent strategies, maps, timelines, discussion questions, research activities, and additional resources. There is also has a free Community Resource and Discussion Guide in English (PDF) and Spanish (PDF). You can find more educational resources on civil resistance in Vietnamese and over 65 languages in our Resource Library.